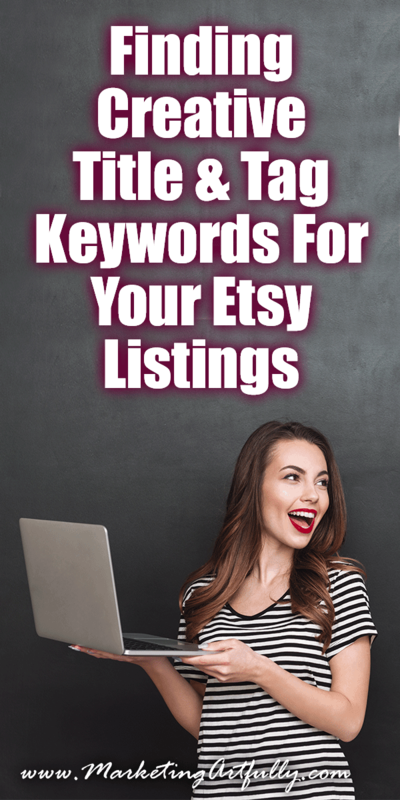 The hardest part about doing Etsy SEO is figuring out how to keep your good listings popular, but also increase the views on your “loser” listings or launch new products that will rank well in Etsy search. 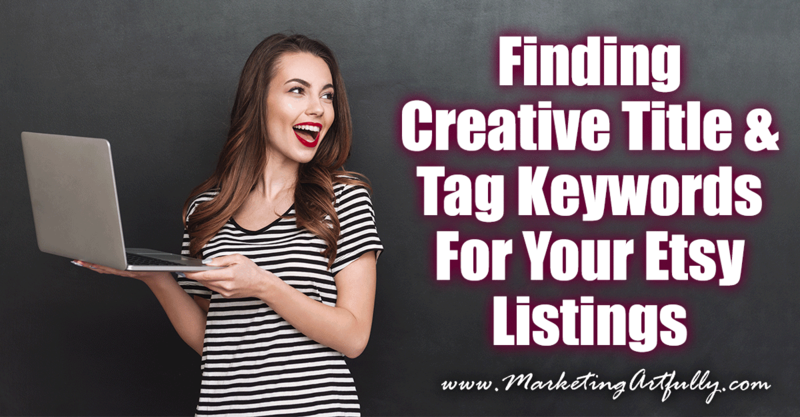 A big part of this process is figuring out new and unique tag and title keywords that you can use! 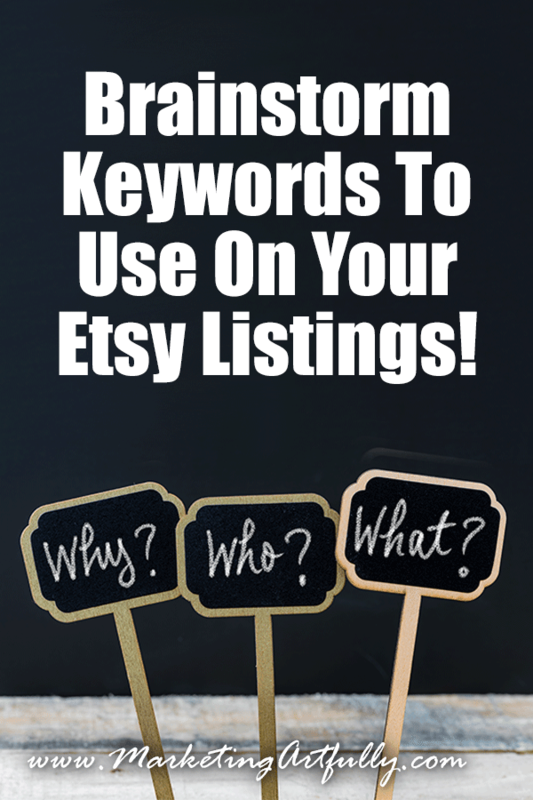 Today we are going to talk about how to find creative title and tag keywords that will help you branch out into other hot sales channels on Etsy! Find Your Low Hanging Fruit – Winner Winner Chicken Dinner! We know that these are “winner” keywords that we already use in our popular listings and that will be ones that we want to keep around! DO NOT CHANGE THESE!!! 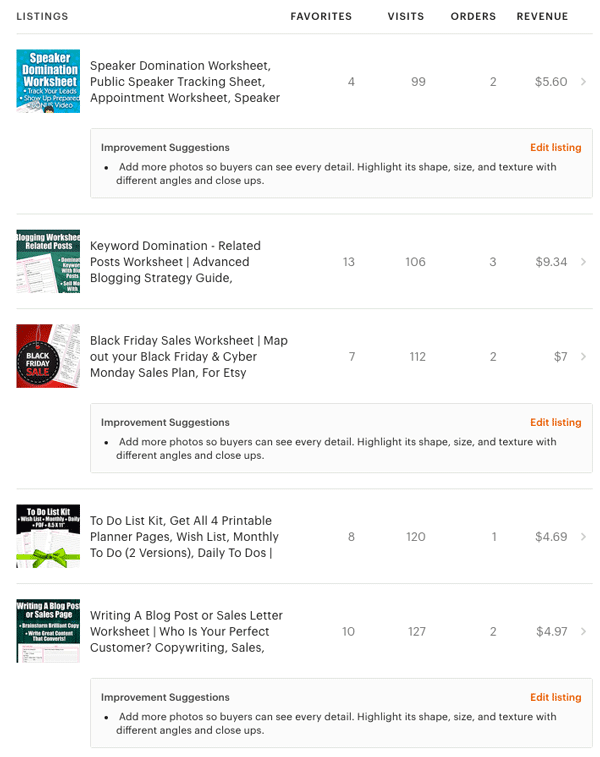 It surprises me that two of my worst sellers are about blogging as that is a focus of my website and one of my top sellers is a blogging planner. So this is where I can make some changes…. you can “mess around” with your losers ruthlessly! NOTE: When you are changing your listing’s tags and titles start with the LOSER listings and new listings rather than messing with your “winner” listings!!! Why Not Use The Good Keywords Every Time? One big mistake that I see Etsy sellers make is that they pick one main keyword to rank for and then label EVERY listing with that in their title and tags. This seller is obviously trying to rank for “Personalized Leather Cuff Bracelet”. I know they changed out the color as the first word, but their listings were showing up on page 250 of search because they had every listing as the same keywords. 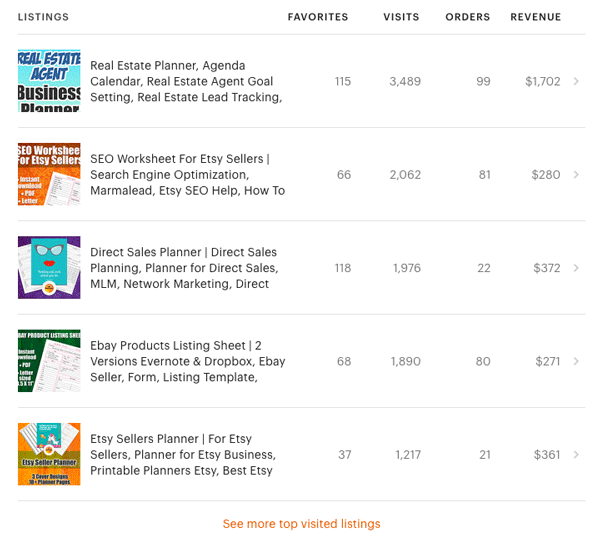 How Etsy Ranks Listings In Search…. There are many different criteria that Etsy uses to rank listings but the one that we are interested in today is what they call “Shop Diversity”. Buyers on Etsy are looking to explore a marketplace of unique items. In order to meet this expectation, Etsy’s search algorithm works to show results from a variety of shops, when available. What this functionally means is that you will only get one listing on each page of a search results page. So even if the shop above had the BEST SEO for “Personalized Leather Cuff Bracelet” they would have one listing show up on page 1, one on page 2, one on page 3, etc. Etsy does this because they want to offer a selection to their shoppers, not just showcase the people that are good at SEO or have the most sales. if you are interested, here is a great post from Etsy about how search works! 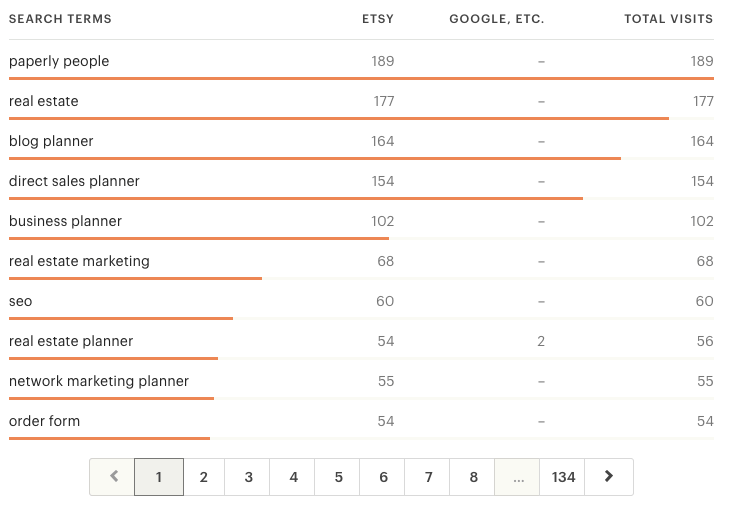 Perhaps the easiest way for you to start thinking about finding new keywords is to use the Etsy search bar itself. 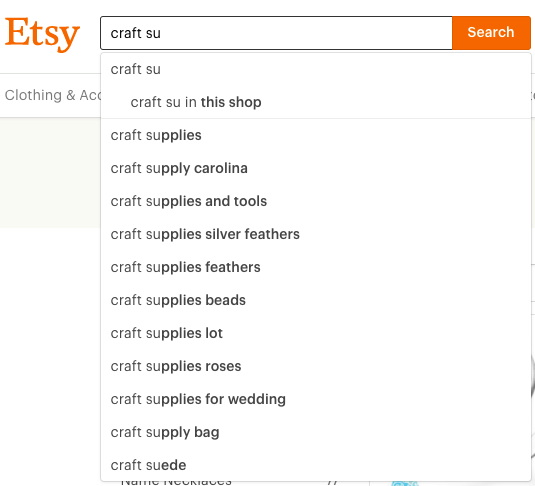 Say we were selling craft supplies and wanted to start figuring out new words to use, we could just start typing “craft supplies” into the search bar and get some ideas! We could note things like “craft supplies lot” to make a product selling multiples of the same product, or start a new niche by positioning ourselves as craft supplies for the wedding buyers. Interesting!!! In this search we found out that people search for terms like “for girls”, “for baby girls” and sizes like “6 inch”. Those are great but are perhaps not actually getting us anywhere new. We are still using keywords that other sellers are using. Sooooo…..
To do this method effectively you have to be willing to think A LOT about who your buyer is and why she might want your product. This is not for the faint of heart, when you start you will feel stupid and foolish like you will never come up with anything decent, but as you go on you will start to get the hang of it and be a keyword ROCKSTAR! Let’s start slow with the easy one! What is your product? This is the factually correct version of this exercise. 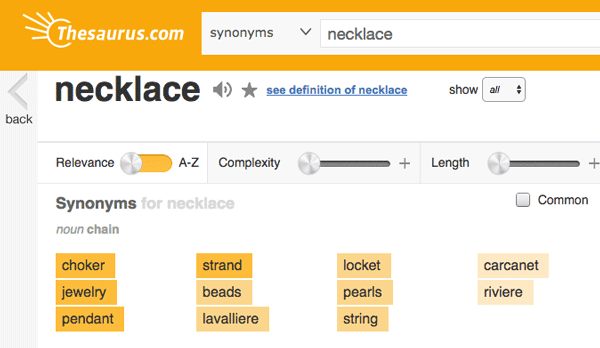 you can use a site like Thesaurus.com to find other words! The next batch are the “whos” … who would like to buy your products. 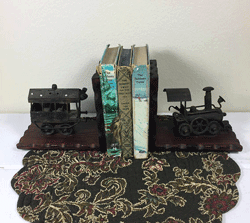 Say you were selling a fun railroad inspired vintage bookend like this one. It would be good for “railroad enthusiasts” and “train lovers”. People do searches all the time to find gifts for the people in their lives who have hobbies or interests. Many times I will put this in my tags and put it in the description (which doesn’t help with search) … These would be an amazing addition if you have a train lover in your life! Where words might make you think of things like “Paris” or “LA” but they can also be be places people would buy your products to use them! These are getting closer to the real reasons that people buy things, to solve a problem in their lives. Say you are going camping and need a fun backpack to carry your gear. You may be willing to spend a wee bit more on something “specialized” like this than you would if you were just going to get a day-to-day backpack. I love thinking about these kind of seasonal items! Bonus, Etsy has attributes that you can select for some of these products. That said, I have seen sellers put their whole store on “christmas” around that time of year, even though they are not selling traditionally themed christmas items. That can backfire as your conversion rate will fall way down as you are not actually selling holiday products. Now, using a term like “stocking stuffer” is great if you have an item under $25! These are super for people to pick up AND Etsy will often send out emails with that search included like “stocking stuffers for kids”. This is the real reason anyone buys anything! To solve a problem they have in their life. Whether they are getting the item for themselves or as a gift, they need to know that the money they are spending is going to solve a problem. This one is the hardest and not the best suited to keywords or tags, but knowing this can help you get some other keywords that might be a perfect fit! One last thing… it is great to find new and exciting keywords and if you have LOTS of listings you can mess around with them all and try to figure out what works best… but what if you don’t have a million listings? How can you check and see which of your new keywords will work best? Just pop the keywords you are thinking of using into their system and they will give you a good idea of which ones have the least competition and the most traffic! For example if you brainstormed some words for a fun “wedding hair bow” you might have picked… wedding hair bow, bridesmaids bow, brides hair bow, white hair bow. As you can see here, “brides hair bow” has super low competition (1,502 compared to over 50 THOUSAND), it has low engagement which means people searching, but if you can have one fancy hair bow that is geared to that bridal market, what a great way to get more exposure for your store. Don’t forget, you have some “winner listings”, now is the time to play around and try and attract new buyers to your keyword and store!